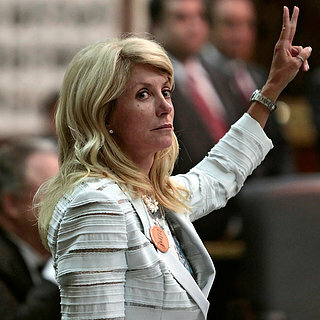 From Red State, By: Matt Vespa (Diary), July 1st, 2013 – With Texas State Senator Wendy Davis’ filibuster of SB 5 last week, she’s become a liberal rockstar. Her filibuster was halted and the bill was passed, but not before the 12am deadline, which killed the bill – for now. The unruly masses of pro-aborts in the gallery caused such a disturbance that procedural motions were unable to be heard, thus preventing the bill from being passed successfully. It was mob rule. The bill would’ve banned abortions 20-weeks into a pregnancy. And Gov. Rick Perry has already called another special session to begin July 1. The bill has the votes. It’s going to pass. Yet, some on the left feel that Davis “revived” the Texas Democratic Party. However, one thing the left misses, possibly due to their hyper-emotionalism, is the fact that Davis’ political stability is tenuous at best. In 2012, when Obama was running for re-election, she only managed to win 51% of the vote. The Obama coattails only gave her a win by a margin of a little over 6,000 votes. That’s it! With Section 4 of the Voting Rights Act being struck down as unconstitutional by the Supreme Court this past week, Texas’ new redistricting plans, which are still up in the air, shouldn’t help Davis either. [If] Davis takes the plunge for governor, she would likely face a well-moneyed Republican from that party’s deep state bench — if not current Gov. Rick Perry himself. And poll numbers indicate that most in Texas don’t know her, let alone favor her. The national attention — and potential money — she is winning from the filibuster might help but won’t be enough to win a statewide race, Munisteri said. Fifty-eight percent of Texans surveyed in a University of Texas/Texas Tribune poll released June 17 said they didn’t know their opinion of Davis or didn’t have one, with an additional 19 percent saying they viewed her neither favorably nor unfavorably. According to Gallup, only 14% of Americans support third trimester abortions. Sixty-two percent of Texans support SB 5. National Journal’s recent poll of American attitudes towards 20-week bans on abortions showed that 48% support such a measure. Most importantly, 50% of women support the restriction – and 52% of 18-29 year olds also agreed that abortion should be banned at twenty weeks. While liberals can tout polling showing that Americans don’t support overturning Roe.v Wade – which is true – it doesn’t mean they’re against restrictions on the procedure. In short, if Davis wants to turn her pro-abortion stance into electoral success, she’s finished. Additionally, if Democrats want to divide their base further after the failed gun control campaign this past winter, then supporting pro-infanticide candidates is the way to go.